The model - the Press Release for this model was issued on 30th May 2008. CREATIVE MASTER NORTHCORD - PRESS RELEASE - 30 MAY 2008. Creative Master Northcord Limited is proud to release hkbus 2010 - the first time pure Stagecoach standard corporate livery without any route-branding has been replicated on the well-known 11-metre, tri-axle Leyland Olympian / Alexander R-type coach model. 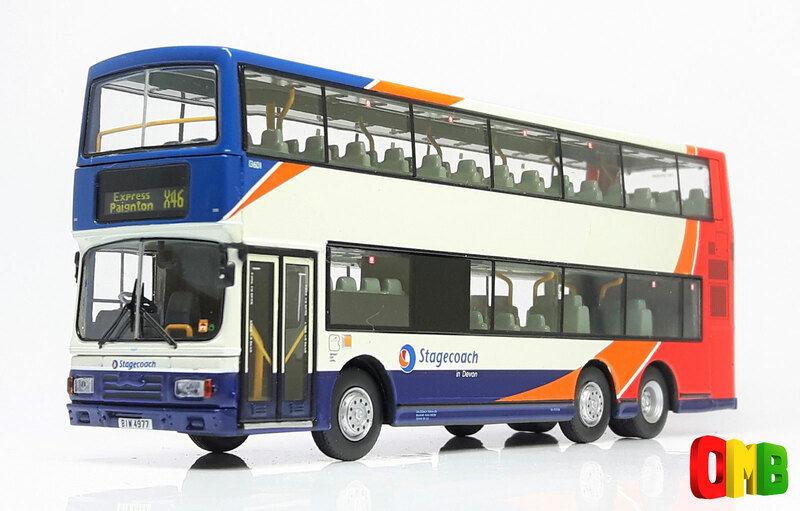 The model represents Stagecoach in Devon 13601 (BIW 4977). 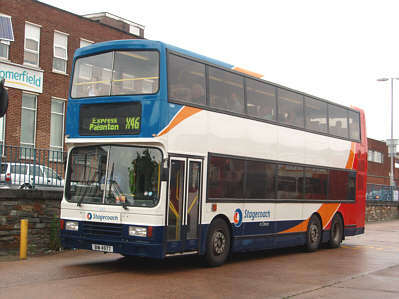 13601 is the premier fleetnumber in the class devoted to the former Citybus Alexander 11m coach Leyland Olympians (135) that returned to the UK for service primarily with the Stagecoach “Megabus” brand. 13601 was used initially on the Oxford – London service where it, and two others from the starter batch of 5, replaced the 96-seat coach Megadekkas that were used to launch the Megabus brand. To begin with the destination was carried on a vinyl sticker in the destination aperture, but as the Megabus brand expanded it later received a dot-matrix screen. 13601 initially carried the name “Keble”, representing Keble College, one of the largest of the constituent colleges of the University of Oxford, on its nearside quarter panel above the headlamp cluster. 13601 was repainted as shown in March 2007. Delivered new to Hong Kong as Citybus 135 (ER 9371) in “Big C” livery 135 with yellow roof, 135 was first registered on 29th November 1990. 135 was one of many to carry special panel branding for Kingswood Villas. 135 later received a white roof on its “Big C” livery then the “Network 26”-style colours. 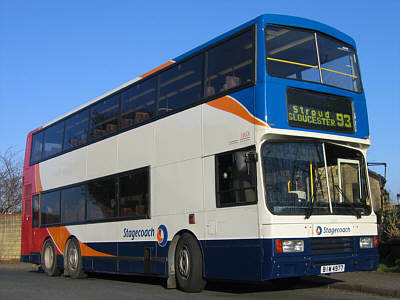 During the summer of 2007, Stagecoach Devon operated three of these 3-axle Leyland Olympian buses on the service X46, between Exeter and Paignton, where their high capacity, air-conditioning and toilet provision proved popular on this local express service. As on the previous successful hkbus 2000 series models produced by CMNL, hkbus 2010 has many innovative designs on the tooling – including all handrails on board and detailed, individual air-vents above the seats. Of note is the improved upper-deck ceiling detail that features the correct colours of the prototype coach. The model also features an accurate representation of the small fleet name at the front, by using tampo printing to good effect. Once again, this is a one-piece casting whose clean lines accentuate the windows and livery application. The model has no ugly metal poles to hold it together. 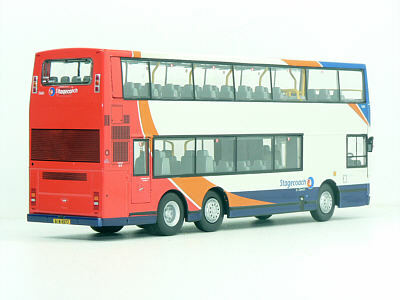 The hkbus 2010 model is limited to 1000 pieces worldwide. They will be distributed by John Ayrey Die-Casts Limited (UK), Concorde Hobby Shop (HK), Porte Publishing Company (Japan), Transit Graphics (Australia) and cnmycar.com (P. R. China).